Western Digital is continuing to expand its WD My Cloud line of "personal cloud" NASes. Last fall, they introduced the single drive WD My Cloud and Tim reviewed the four bay WD My Cloud EX4 in December. 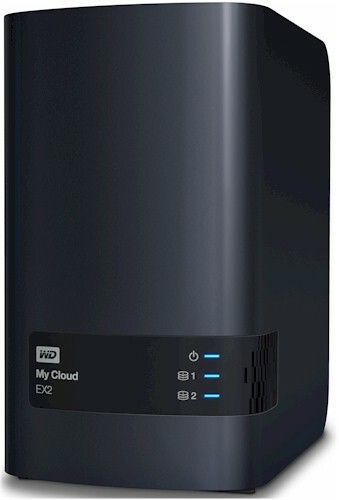 This week, Western Digital is rounding out the product line with the dual-drive My Cloud EX2. The EX2 features an upgraded processor, which helped earn it a higher position on the NAS Ranker than its larger EX4 sibling. Our review unit, a 4TB My Cloud EX2, lists for $369.99. The EX2 will also be available with three additional configurations: diskless (BYOD) @ $199.99; 6 TB at $469.99 and 8 TB at $569.99. For SKUs that ship with storage, WD uses its"Red" series of NAS-optimized hard drives. For the diskless model, WD has a fairly short drive compatability list. Though the EX4 has an LCD status display, the EX2 relies on multi-colored LEDs to provide status. The front panel has only three indicators: Power and one indicator for each drive. The chart below summarizes the LED behavior. The callout image below shows the EX2's rear panel. If you need to install or replace one or more drives, they install from the top. All you need is a Phillips screwdriver to add / remove plastic pull-tabs on each drive. The drives just slip into the drive bay - no tray is needed. The drives are held in place by a simple hold-down bracket.